This shareable bread bowl definitely isn't gluten free. But it may be the ticket to romance. Soup isn't necessarily considered to be a romantic food, but this Valentine's Day, Panera Bread is hoping its viral creation may spark a little love. 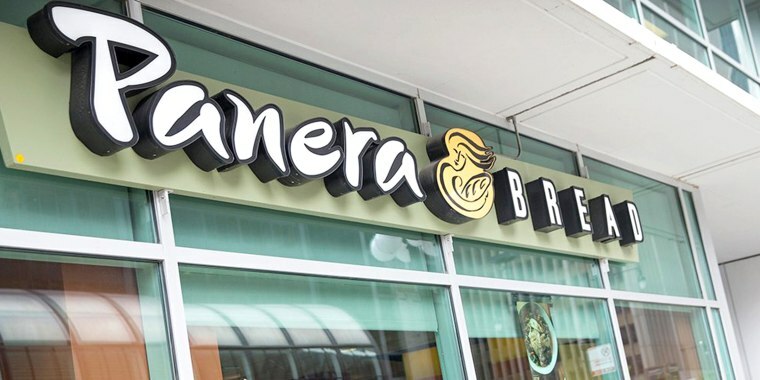 Panera is launching its "double bread bowl" nationwide on Thursday, Feb. 14, so carb lovers can slurp their favorite soups from the same vessel. And it just gets cheesier from there. Not only can romantic duos and galentines each choose their favorite two soups to be ladled into one large loaf of bread, they can also get a hefty portion of mac and cheese — if they dine in the restaurant. Before you cancel that fancy restaurant reservation or throw out all the groceries you bought to make the perfect Valentine's Day meal, just know there's a catch. Two catches, actually. So unless you're obsessed with Broccoli Cheddar, bundle up and scoot to the store to order the carb combo of mac and cheese and bread and mac and cheese and bread. The other heartbreaking side of this Valentine's Day deal is that it will come to an end on Feb. 28. When the double bread bowl was first tested in Philadelphia in August 2018, fans fell hard and fast. Now that Panera is letting patrons have a taste of double bread nationwide, who's to say what kind of mourning period will ensue in March. When the bowl was first tested, bread fiends were totally in awe of it. Some were just super, super excited. IM NOT THE ONLY ONE FREAKING OUT OVER THE NEW DOUBLE BREAD BOWL AT PANERA RIGHT? And others offered their appreciation and gratitude to its creators. Depending on the soup combos chosen and store location, Panera's double bread bowls start at $10 each.